Can I apply on the day of the event? No. Requests for application will not be entertained post closure of respective application dates. 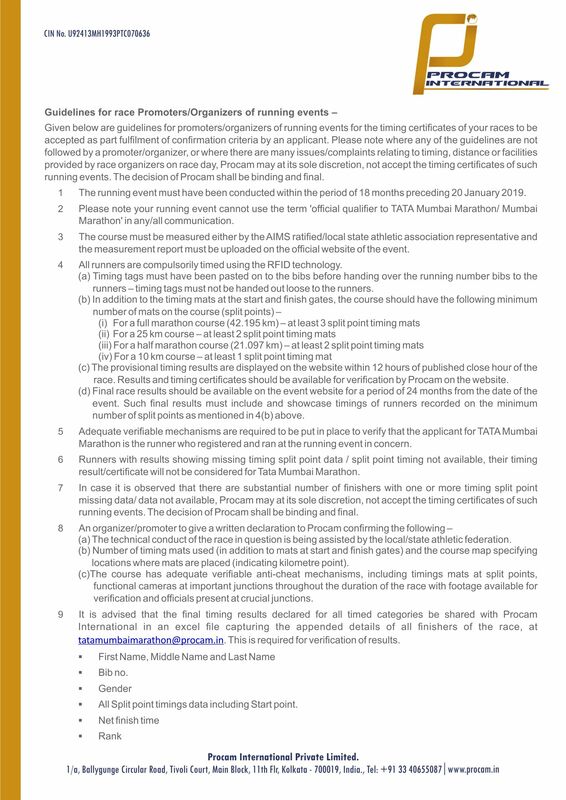 What is the minimum age eligibility for applying in Great Delhi Run race category? NO, Race day t-shirt is offered only to confirmed participants of Half Marathon category. While the Airtel Delhi Half Marathon & Puma will make best efforts to get you the mentioned t-shirt size, the Promoter & Sponsor will not be held responsible in case of shortage of any t-shirt size / color. The color and sizes of Race day t-shirt are ordered well in advance, however in case of any shortfall the next available size will be offered . Which payment mode will be accepted for online application? An online applicant can pay ONLY via Scratch Card, credit card, net banking or debit card. Can I apply for more than one race category? No. An individual can apply only for one race category in the Event. An application form received with two options chosen or an online application made multiple times, will be rejected. Multiple applications will entail in all being rejected. No. An applicant has to sign the waiver himself/herself. You cannot apply on your friend's behalf. Can I run with somebody else’s running BIB on race day? No. All participants’ race day images will be screened visually after the race and if any of the participant is found not wearing the running number bib allotted to him/her, the participant registered for that bib will be disqualified from the race and the subsequent edition of the event in 2019. Further, Procam International reserves the right to take necessary legal action against the registered participant and the person who has used the running number bib on race day, for impersonation. Are there any confirmation preference criteria in Great Delhi Run / Sr. Citizens’ Run / Champions with Disability? Confirmation preference criteria do not apply to application and confirmation process of the Great Delhi Run/Sr. Citizens’ Run/Champions with Disability categories. Applications for these categories will be accepted on first-come-first-serve basis, until close date of applications or until running places for each of the categories are filled, whichever is earlier. Yes, but ONLY if you wish to participate in the Great Delhi Run, Senior Citizens’ Run or Champions with Disability. No group applications will be accepted for the Half Marathon race category. Also, please do not club Half Marathon and Open 10K applications with group applications of Great Delhi Run, Senior Citizens’ Run and Champions with Disability – such applications will be disqualified. All the members of the group need to register individually online. Yes, however, a representative can submit individual applications for not more than 5 applicants. Govt. issued photo ID proof will include documents like Passport, PAN Card & Aadhaar Card. What should I do if I am unable to open the application website? What options do I have in case my application gets rejected/I was not able to apply on time? Unregistered applicants can approach Event’s official Philanthropy Partner, India Cares Foundation, for charity running places. Such charity running places will be available at premium and the proceeds of the same, minus the applicable entry fees, will go to the NGO chosen by the respective runner. It is important that the NGO must be listed as participating NGO with India Cares Foundation. Will I get a refund of my entry fees on my entry not having been accepted? Can I transfer my application in favour of another person? Is Goodie bag available to all participants of ADHM 2018? Is there finishers medal and certificate available to all Great Delhi Run participants of ADHM 2018? Great Delhi Run is a non competitive fun run and there are no finishers medal or certificate given in this category.